Speed, invented by SODIMAS is an innovative patented technology unique in the world that is based on the variable speed of movement of the lift car according to the load being moved. This technology significantly reduces energy consumption (30%), improves traffic and increases the travel speed. Thanks to the limitation of power generated by the variation of speed according to the lift car load, the devices equipped with Speed technology work on a single-phase network for lift cars up to 630 Kg of payload. 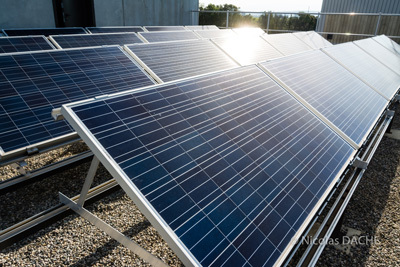 This is an important asset for the configuration of a lift installation specifically when connecting to various renewable energy systems such as solar power for example. Speed now accepts any type of renewable energy that can be modified over time. Today, a lift spends more than 90% of its time traveling with a load below its maximum capacity. Based on this simple observation, our research and development teams have found ways to optimise the power consumption of the device. By regulating the lift movement speed according to the load being lifted, we were able to develop . Speed boasts another feature that when the device is empty or with a low load, it moves faster (30%), helped by an optimised balance of the lift car. When the load exceeds a threshold close to the maximum load the device automatically reduces its speed up to 30% (about 1% of cases according to VDI 4707). This technology reduces the power consumption of the device during each movement whilst maintaining optimum yields. Speed operates in standalone mode in the event of external power failure (inverter kit option). Total autonomy is also possible (optional solar kit on batteries). Integrated for a global reflection of sustainable development, Speed requires no additional components as the technology is entirely supported by the Speed controller. Speed technology also integrates the standby of all electronic components during extended shutdown periods. Counterweight load reduction improves component durability and reduces waste processing when it is replaced. Thanks to the combination of all these elements, Speed allows for superior energy performance standards than those required for a VDI A classification. 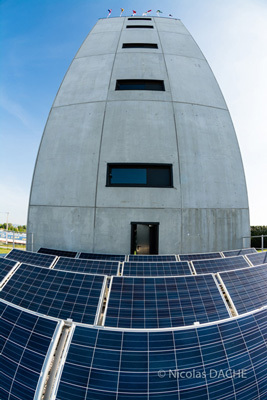 A lift equipped with Speed technology and powered by solar energy has been installed since 2014 in the test tower at our head office.